Middle Eastern nomads and villagers have used a variety of techniques to create stunning textile art. The most common structures are shown below, while more complete descriptions, detailed illustrations, and numerous variations are presented in my book, WOVEN STRUCTURES. This is the technique used most frequently for the flatwoven rugs and hangings called kilims. Slit tapestry is also used for bags, pictorial tapestries, and other articles. The fabrics are usually weft-faced, meaning that the warp is covered completely; the surface is ribbed in a vertical direction. Warp yarns are those that were affixed to the loom; weft yarns are those that were interlaced with the warps. In all of the photos here, the fabrics are oriented as they were on the loom--with the warps running vertically. In tapestry weaving, weft yarns are discontinuous; the artisan interlaces each colored weft back and forth in its own small pattern area. With slit tapestry, at each point where colors meet, a small slit occurs if the pattern boundary is vertical. 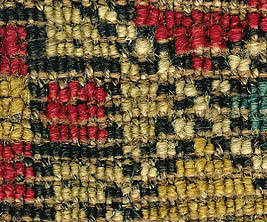 Other tapestry techniques, in which wefts are dovetailed or interlocked, overcome this potential problem but have their own disadvantages. Slit tapestry produces the sharpest pattern delineation and the smoothest weave. It also permits the most freedom and spontaneity; thus it is a favorite technique among weavers worldwide. Slit tapestry is fun to weave. You can see in the loom photo that slit-tapestry kilims are woven in separate sections, in a very free-form sort of way. Rarely are pattern parts woven with single wefts, one and then another, right across the loom. Usually tapestry designs are bolder and more dramatic than those produced with other nomadic weaving techniques. Since the weaver avoids long vertical lines in her pattern (to avoid long slits), designs are composed primarily of diagonal and horizontal elements. To construct a strong piece, intersecting diagonal pattern lines are also avoided. Because most kilim designs have been shaped significantly by structural considerations, most tapestry motifs have developed directly on the loom; they have not been copied from other sources. This is why we find designs similar in character wherever slit tapestry is produced around the world--whether by Anatolian, Navajo, Pre-Columbian Peruvian, or other weavers. Slit tapestry. The wefts are, however, packed down tightly to cover the warps. Tapestry weft yarns need not always be strictly horizontal. They can be pushed about as the weaver wishes, to easily form curved or slanting shapes. Egyptian weavers who put animals, plants, and human figures into their tapestries use the same techniques as Anatolian, Persian, and Caucasian kilim weavers, but simply do not restrict themselves to geometric or quasi-geometric forms. When we compare Senneh kilims from western Iran which have erratic wefts, with the Harranian folk art tapestries of Egypt, the structural similarities are striking. Weavers sometimes choose to weave slit-tapestry pieces sideways. The loom's width is always a limitation, but the direction can also be shifted for design purposes. An Egyptian artist who wishes to portray a group of long-legged animals and still avoid long slits, logically produces her piece sideways on the loom. Indeed, the internal rhythm in such pieces is nearly always dominated by a verticality in the designs. On the other hand, pieces woven right-side-up display a predominance of horizontal forms, as shown in the photo above. When tapestries like these are designed directly on the loom, with no preliminary drawings, the natural tapestry processes help to shape graceful imagery. Weavers in several areas have avoided the problems of slit tapestry by either interlocking their wefts at color junctions, or "dovetailing" them. There are disadvantages, however, as the techniques are more restrictive. These structures are illustrated and explained in WOVEN STRUCTURES. More intricate patterning can be done by wrapping colored yarns around the warps--usually single warps or pairs. Most commonly, rows of this pattern-yarn wrapping alternate with thin, plain-weave ground wefts. Because the technique is time-consuming, it has frequently been used for bags and other small, sturdy weavings. Soumak wrapping most often covers entire surfaces, although occasionally figures are scattered about on open, plain-weave fabrics. Exquisite examples come from the Caucasus, from northwestern Iran, and from a few other areas. Kurdish weavers in eastern Turkey have sometimes produced weftless soumak bags--with no intervening ground wefts. Variations in soumak structures occur when the direction of wrapping is altered, or when the weaver outlines her design in diagonal directions. Sometimes the yarn segments are offset; other times the structure is reversed, so that the usual back side serves instead as the front. There are few design restrictions with these techniques, and so motifs have often been borrowed from other weaving traditions. The hooked motif on the soumak Shahsevan mafrash (bedding bag) panel above is an old standard slit-tapestry kilim design. Fine designing has been done by Moroccan, Algerian, Baluch, Turkmen and Persian Afshar weft-substitution weavers; they substitute variously colored wefts as desired in otherwise perfectly plain weaves. Although there is not an easy popular label for this technique, the structure is distinctive. Complex geometric designs are executed entirely by hand. The loom does not, in some magical sort of way, help with the patterning. Moroccan weavers work from the fabric's back side, Asian weavers more often from the front. 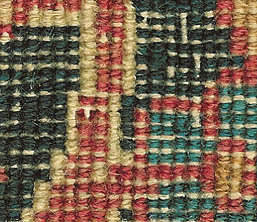 Like tapestry, this is a weft-faced weave: we see the warps only where they emerge at the end of a weaving as fringe. As the weaver uses first one color, then substitutes another in the intricate patterning, she either lets the unused yarns float on the rug's back side, forming a thick padding, or she cuts her yarns and lets the ends hang loose on the back. Afshar, Baluch, and Turkmen weavers have most often arranged intricate weft-substitution patterns in series of crosswise bands. The structure is also used commonly in small borders at the ends of Baluch pile rugs, providing an effective textural contrast. Moroccan Berbers have pushed the design possibilities of weft substitution to an extreme, producing allover patterning with incredible detail. Although they are often mistaken for embroidery, brocaded designs are produced entirely on the loom, as the fabric is woven. Soft, lustrous pattern yarns are interlaced entirely by hand, and these pattern rows alternate with thin, plain-weave ground wefts. With most kinds of brocading, the weaver works facing the back of the textile. She interlaces each pattern yarn back and forth in its own pattern area, using small finger skeins which dangle on the back when not in use. The inlaid brocading on Turkmen tent bands is an exception; it is worked from the front, and is often combined with knotted pile. A wide variety of brocaded articles have been made by Middle Eastern weavers, especially Y�r�k, Turkmen, and Kurdish tribal weavers in Anatolia. Elaborately ornamented storage sacks called ala �uval have been made with brocading, as well as saddlebags, tent panels, hangings and covers. Unfortunately, as nomads have settled into village life and have taken up pile carpet weaving, the old brocade skills have gradually disappeared. Only in a few places do tribal weavers continue to produce this wonderful, but rather difficult textile art. Several quite different types of brocading have produced a rich variety of patterning; these are discussed and illustrated at length in WOVEN STRUCTURES. This construction is the exact opposite of weft-substitution. Both structures are plain weaves in which yarns are substituted to make designs, but warp-substitution fabrics are warp-faced and it is the warps that substitute, one for another. The warp yarns are spun and plied tightly, so they are tough and elastic, then they are jammed so closely together on the loom that when the fabric is woven, the wefts are hidden. Warps are left loose on the back of the fabric where they are not part of the pattern. This weave has been used primarily for tent bands and sturdy striped covers called jajims. The design options with warp-substitution are severely limited, since warps of contrasting colors must be incorporated in nearly equal proportions to maintain proper warp tension. Many designs which originated in this ancient technique have become important in pile-rug design repertoires. Designs tend to migrate from restrictive techniques like this one to less restrictive techniques. Knotted structures are, of course, used for the wide range of plush pile carpets popularly known as Oriental rugs. But tribal weavers have also knotted tent bags and saddlebags, saddle covers, animal trappings, cushions, door hangings, tent girths and other articles. Sometimes knotted pile has been combined with one or more of the flatweaves. To form the pile, small segments of colored yarn are attached firmly to pairs of warps. The Asian or North African weaver works with the loose end of a continuous yarn, wrapping each individual knot and then cutting the yarn before starting the next knot. (This differs from the processes used by European and North American weavers who make flossa or rya pile rugs.) After each row of knotting, one or more wefts are inserted and packed down tightly. The precise manner in which this is done determines the rug's flexibility, thickness, and durability. I have explained several variations in WOVEN STRUCTURES. Knots of two basic types have been used throughout Asia and North Africa: asymmetrical and symmetrical knots. The first, the asymmetrical knot, sometimes called the "Persian" or "Senneh" knot, is superb when fine design detail is desired, because these can be closely packed. Not true "knots," each short yarn segment is wrapped around two warps, but only encircles one of these completely. Either the right or left warp may be enclosed. Asymmetrical knots predominate in Iranian, Central Asian, Indian, and Chinese production. On workshop carpets, alternate warps are often pushed behind to allow a more compact structure. This is done by alternating a heavy, stiff weft yarn with a finer, more flexible and sinuous weft. Sometimes three-weft sequences are used. These dense constructions are described as having depressed warps. Symmetrical knots are inherently more secure, and thus are excellent for coarser weaves. The pile yarn wraps around a pair of warps from opposite directions, and the ends emerge together, between these warps. In knot-making terminology, this is a "clove hitch." Symmetrical knots are typical in Turkish and Caucasian rugs, but they also appear in some Turkmen rugs, some North African weavings, and a good many Persian village rugs. In older rug literature, symmetrical knots have been called "Turkish" or "Ghiordes" knots. Other kinds of knotting have been used in more isolated rug- weaving areas like Tibet and Morocco's Middle Atlas Mountains. Tufted rugs made with punches or tufting guns on pre-woven fabrics in China have sometimes have been confused with hand-knotted carpets. With tufting, no warps are encircled completely, and the backs of these rugs are usually sprayed or painted with adhesives to secure the pile yarns. Knot counts are one gauge of quality in some large workshop carpets, but with antique rugs there is little correlation between a rug's coarseness and its value as textile art. Other qualities are more important: the artistry, craftsmanship, rarity, wool quality, and the weaving's importance as an historic or ethnographic object. If you wish to identify the knots in your rug, you must first determine which end of the rug was at the top when it was woven. The fringe yarns on the ends are the warp. Running lengthwise through the rug, these were the yarns stretched on the loom. Stroke the pile; knots were tied with the pile inclining downward, toward the bottom of the loom. As the weaver wrapped each knot, she tightened it by pulling it downward or toward her, against the already woven fabric. A novice should start by examining the most coarsely woven rug available, perhaps an Anatolian, south Caucasian, or Kurdish piece. First, on the front of the rug, fold a section along the wefts, parallel with a row of knotting. Since rugs with the lowest knot counts are usually symmetrically knotted, that is probably what you will see. Each knot spans two warps and has a wide "collar" horizontally across its top. Two pile tufts emerge from under this collar, usually merging to look like one. If you cannot see individual knots clearly, try an intricate section of the design with narrow, but lightly colored pattern parts. As you handle a flexible old symmetrically knotted rug, you will begin to see the surface as lots of small square, chunky pile sections. This characteristic is accentuated if the pile is worn. Once familiar with symmetrical knots, you will easily recognize those that are not, almost by default. Instead of an unbroken series of collars, on rugs with asymmetrical knots there are alternating tufts of pile and much smaller collars, each the width of a single warp. Asymmetrically knotted constructions do not separate readily into small square sections unless they are quite coarse, like some Chinese Ninghsia pieces. Asymmetrical knots can be tied so that they either "open to the left" or "open to the right." With some rugs you need only rub your hand lightly over the surface to determine their direction. If the pile fibers slant obviously to one side, the knots open that way. Otherwise, look for a place with a single knot in a light color; the knot opens on the side of the collar where the tuft emerges. It may help to fold the rug vertically and roll it back and forth slightly to isolate a column of knots. The vast majority of workshop carpets with severely depressed warps have asymmetrical knots. Persian Bijar carpets are one exception; they are symmetrically knotted. By folding a rug along a narrow vertical outline it is usually possible to see whether a knot's two yarn ends emerge singly or together from under its collar. If you wish to determine the knot count in your rug, remember that each knot is "tied" or wrapped around two warp yarns. (Some North African knots are exceptions, while Tibetan structures are another matter entirely.) On a majority of village or "tribal" rugs, each knot forms two "nodules" on the back of the rug. If alternate warps are severely depressed, however, as in many intricate workshop carpets, only one nodule may be visible on the carpet's back, while the other is hidden. Narrow design elements, like vertical borders or pattern outlines, are normally only the width of a single knot so they are useful details to examine. If both parts of each knot are visible, as in the black vertical outlines of the Caucasian rug at the left below, we count the nodules in pairs to determine the number of knots horizontally per inch. If only one nodule is visible, as in the narrowest yellow or red vertical outlines of the Persian workshop carpet at the right below, we can be sure that alternate warps are completely depressed, and we are seeing only half of each knot. Since the other part is hidden, we must count every nodule on the surface. Rugs that are ribbed on the back have alternate warps just partly depressed; on these we are likely to see one nodule clearly, but only part of the other, and so must be more careful. Back of a Caucasian rug with no warp depression. Both parts of each knot are visible, so we count PAIRS of nodules to determine the horizontal knot count. Back of a Persian workshop carpet with completely depressed alternate warps. Since only half of each knot is visible, we count all nodules to determine the horizontal knot count. Counting knots vertically is less problematic, since nothing is hidden. It's best to focus on areas with lots of color changes, especially areas where the color of the knots contrasts with the color of the wefts between them. Knot density is cited in rug literature either in knots per square inch, or knots per square decimeter. Check the density in more than one part of your rug, since slight variations are likely. Sometimes on a very tightly woven rug it is difficult to see the wefts, let alone count rows of knots, even under a magnifier. Here's a trick: If you mark a vertical inch on the rug by sticking in two pins, then you can roll the rug slightly so that the rows separate a bit, and you can count the rows of knots between your pins. In determining a rug's origin, not only are its design, colors, and knotting significant, but other subtle details are telling. In WOVEN STRUCTURES I have illustrated the many different and distinctive ways that selvages and end finishes are constructed. Knotting idiosyncrasies, variations in the handling of wefts, and differences in the materials used by the weaver offer further clues to a rug's provenance. Junko Ito, Tokyo editor and kilim collector, has now produced a web page with a Japanese translation of the above text. Many thanks, Junko!